There are some truly amazing shows in NY’s Chelsea at this moment (subject to the following blogposts), but the most spoken of are the ones of art superstars Paul McCarthy & Jeff Koons. 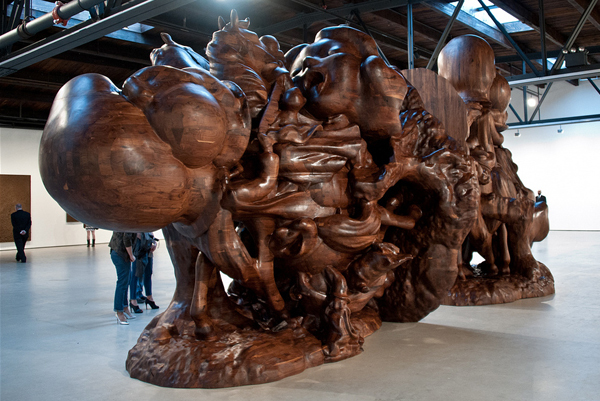 Each artist occupies multiple gallery spaces at once (McCarthy’s is at both Hauser & Wirth locations, Koons is at Gagosian as well as at David Zwirner) and each presents monumental sculpture series, which – set in the vast spaces of their mega-dealers – will leave your head spinning. These are must-see shows, completely megalomaniac and utterly impressive, as expected from such notorious taste gamblers. So head over to Chelsea, you won’t be disappointed. 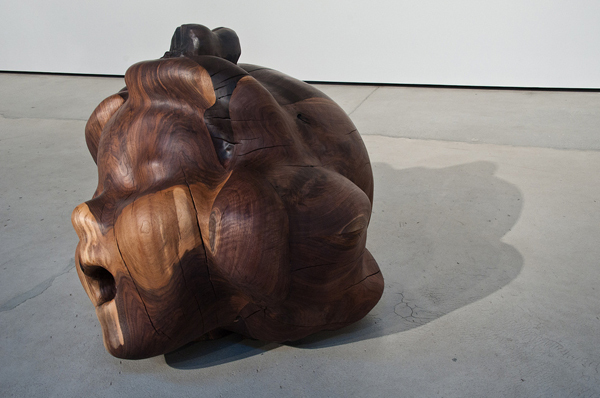 The show presents McCarthy’s latest additions to his ongoing White Snow project: 6 massive black walnut wood sculptures, series of Tree Forest Monochromes and series of drawings. The inspiration for this epic work-in-progress is the classic German fairytale of Snow White (and its Disney variant) transferred onto McCarthy’s horror-sweet house style. The final version of the WS (White Snow) project will make its debut at the Park Avenue Armory on June 19th, complete with 8, 800 square foot of artificial forest, life-size replica of a cottage in Salt Lake City where Mc Carthy was raised, video projections and further sculptures. Hey-ho, let’s go! The uptown branch of H&W presents series of platinum silicon life casts of Elyse Poppers (the actress who plays McCarthy’s primary White Snow character) and the artist himself. The casts are created with help of the latest special effects technologies and they look fearfully real. Also on display is a 4-channel video installation documenting the actual life casting. 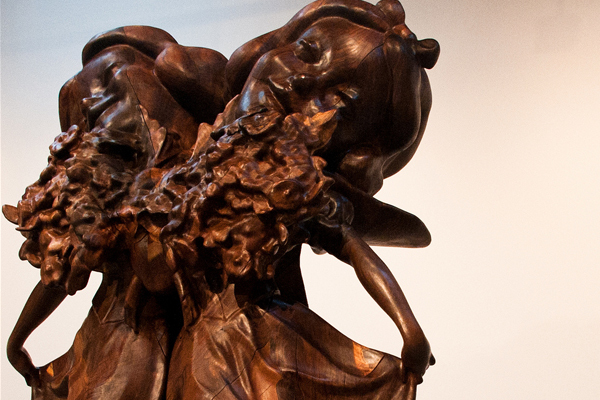 The artist comments: “Life casting liberates the literal through a kind of unifying monotone. It creates a different representation of the original thing that lets me explore where reality and abstraction intersect”. 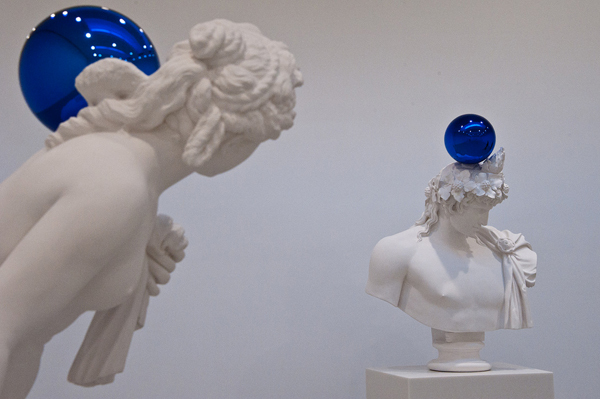 New sculpture series of Jeff Koons, titled Gazing Ball, takes its inspiration from a decorative garden element (glass ball painted on the inside and reflecting its surroundings) from rural Pennsylvania, where the artist grew up. 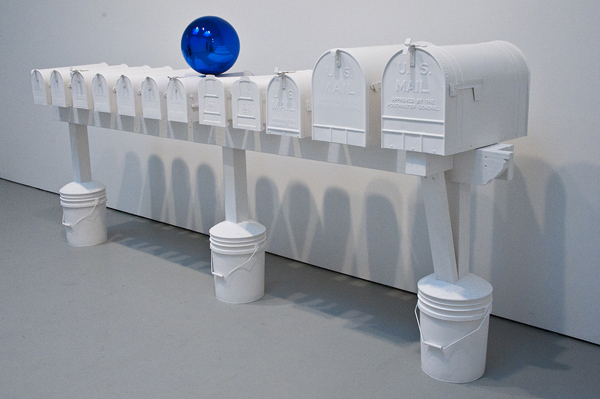 While the material (white plaster) and the use of antique Greco-Roman casts are new, the series is conceptually very close to Koons’ love of the middle-class aesthetics and values. Prices? $3 million for the large sculptures, 6 digit numbers for the smallest. Alternatively, you can get a gazing ball at the local Target store for just under $50. 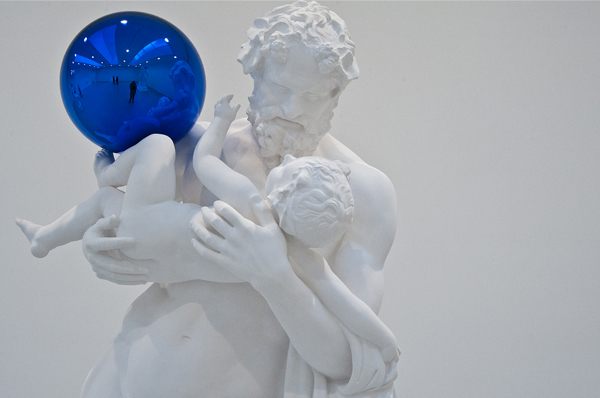 If Koons’ strategy to exhibit with Zwirner, rather than his primary dealer Larry Gagosian, was meant to shake the latter’s awareness (who hasn’t done a major show of Koons in NY until now), then it certainly reached its goal. Gagosian readily mounted Koons’ solo in his Chelsea multiplex. Hyper-realistic paintings, balloon sculptures, Shrek inflatables, plastic toys… and size mattered. In truth, everything in this show is so super-sized, that it starts looking like a movie set. Our favorite piece was the Balloon Venus, a stainless steel twisted-balloon version of one of the world’s oldest sculptures, Venus of Willendorf (trivia: Koons’ balloon-twisting consultant has allegedly created over 80 versions before the artist approved — perfectionistic as ever, that Jeff). There’s more of Jeff Koons coming to NYC in 2014, when the artist will have a full-career retrospective at Whitney together with his long term dream project realized: a full-size replica of a working locomotive hanging from a crane nose down. Yeah!